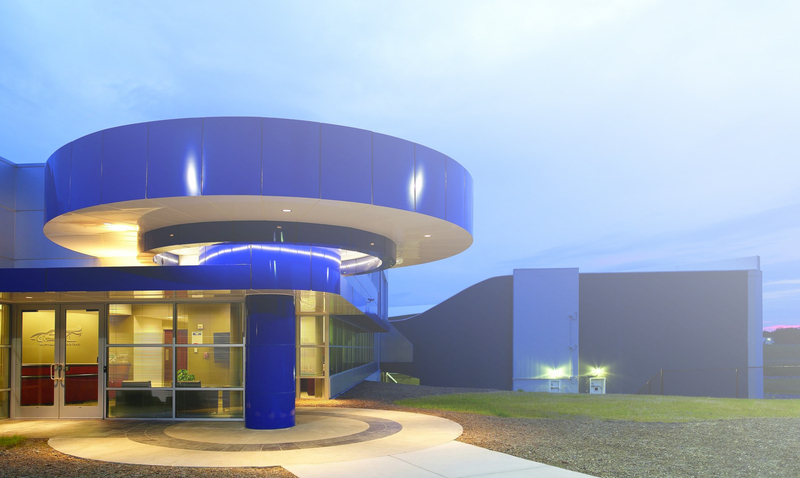 Experience 180 mph at Windshear’s full-scale, rolling road, aerodynamic wind tunnel in Concord, North Carolina. Windshear continues to set the industry standard. 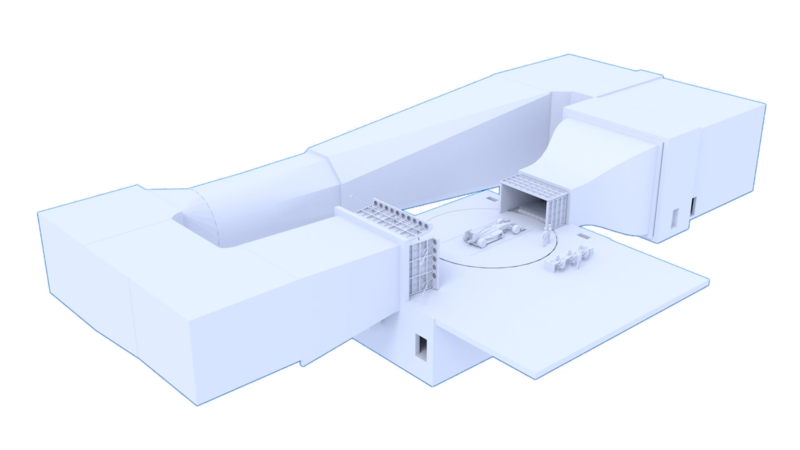 Established in 2008, Windshear is an independent rolling road wind tunnel facility focused on the customer experience. 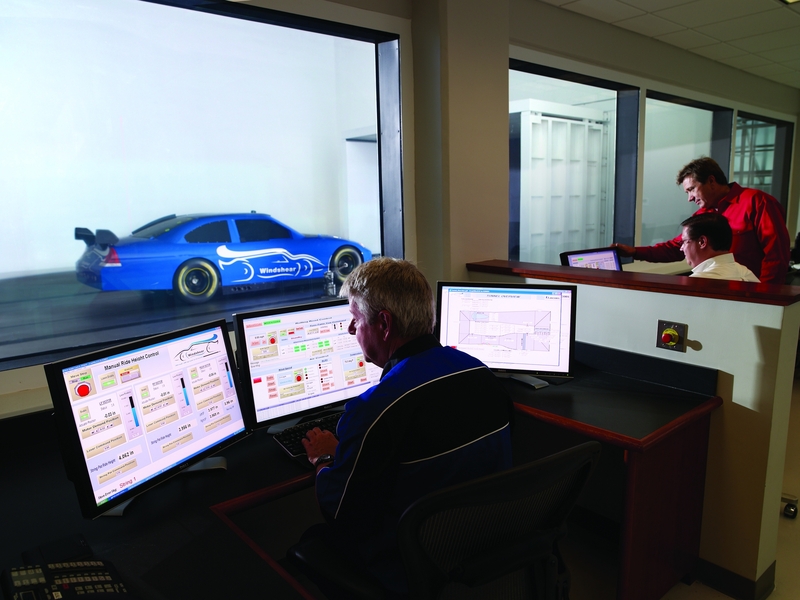 Windshear provides manufacturers, motorsports teams, and a variety of other automotive clientele access to a state-of-the-art facility that delivers actionable and repeatable results. Select a number below to zoom in and learn more. Please email Brian Nelson at bnelson@windshearinc.com or call us at 704-788-WIND (9463) with questions and inquiries. Ready to send your test article? Your access and use of the Wind Shear, Incorporated website (the “Site”) (www.windshearinc.com) is subject to the following terms and conditions (“Terms and Conditions”) and all applicable laws. By accessing and browsing the Site, you accept, without limitation or qualification, the Terms and Conditions and acknowledge that any other agreements between you and Wind Shear, Incorporated are superseded and are of no force or effect. This website and its content is copyright of Windshear Inc. – © Windshear Inc 2009. All rights reserved. 1. You should assume, unless otherwise noted, that everything you see or read on the Site is copyrighted and may not be used, except as provided in these Terms and Conditions or in the text on the Site, without the written permission of Wind Shear, Incorporated. Windshear, Incorporated neither warrants nor represents that your use of materials displayed on the Site will not infringe rights of third parties not owned by or affiliated with Wind Shear, Incorporated. 2. While Wind Shear, Incorporated uses reasonable efforts to include accurate and up-to-date information on the Site, Wind Shear, Incorporated makes no warranties or representations as to its accuracy. Wind Shear, Incorporated assumes no liability or responsibility for any errors or omissions in the content on the Site. 3. Unless otherwise noted, the trademarks, logos, and service marks (collectively the “Trademarks”) displayed on the Site are registered Trademarks of Wind Shear, Incorporated. Nothing contained on the Site should be construed as granting, by implication, estoppel, or otherwise, any license or right to use any Trademark displayed on the Site without the written permission of Wind Shear, Incorporated or such third party that may own any Trademarks displayed on the Site. Your misuse of the Trademarks displayed on the Site, or any other content of the Site, except as provided in these Terms and Conditions, is strictly prohibited. You are also advised that Wind Shear, Incorporated will aggressively enforce its intellectual property rights to the fullest extent of the law, including the seeking of criminal prosecution. 4. Images of people or places displayed on the Site are either the property of or used with permission by Windshear, Incorporated. The use of these images by you, or anyone else authorized by you, is prohibited unless specifically permitted by these Terms and Conditions or specific permission provided elsewhere on the Site. Any unauthorized use of the images may violate copyright laws, trademark laws, the laws of privacy and publicity, and communications regulations and statutes. 5. Unless otherwise noted, the trademarks, logos, and service marks (collectively the “Trademarks”) displayed on the Site are registered Trademarks of Wind Shear, Incorporated. Nothing contained on the Site should be construed as granting, by implication, estoppel, or otherwise, any license or right to use any Trademark displayed on the Site without the written permission of Wind Shear, Incorporated or such third party that may own any Trademarks displayed on the Site. Your misuse of the Trademarks displayed on the Site, or any other content of the Site, except as provided in these Terms and Conditions, is strictly prohibited. You are also advised that Wind Shear, Incorporated will aggressively enforce its intellectual property rights to the fullest extent of the law, including the seeking of criminal prosecution. 6. Wind Shear, Incorporated has not reviewed all of the sites linked to this Site (if any) and is not responsible for the contents of any off-Site page or any other sites linked to this Site. Your linking to any other off-Site pages or other sites is at your own risk. 7. Wind Shear, Incorporated may at any time revise these Terms and Conditions by updating this posting. You are bound by any such revisions and should therefore periodically visit this page to review the then-current Terms and Conditions to which you are bound. Copyright © 2018 Windshear, Incorporated. All rights reserved. After turning onto Ivey Cline Road, please take the second entrance on the right. Pull up to the gate and call the front desk from the call box to be let in. Badges can be picked up at reception (first entrance on the right).